Dalton (Patrick Swayze!) is a bouncer is clubs that have problems with fighting visitors. His fame spreads all over the USA and he is hired to clean up a place in some small town. His ‘my way or the highway’ method brings some troubles that usually blow over quickly, but in this case, Dalton comes into trouble with the towns rich man who goes very far to show that it is him that runs the town. The film is a true product of the 1990’ies. The fashion, haircuts, cars and music, even people’s faces somehow look 1990’ies. There is not much of a story, but of course (as it is supposed to be in a 1990’ies film) the introvert pretty boy falls in love ‘untactically’. The film has a lot of bar-fights (of course) and a little bit of other kinds of action. 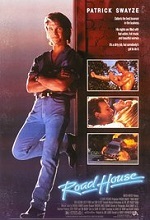 This is not my type of film, but “Road House” is actually an amusing watch. The acting is good, there is some humor and old-fashioned action. It really reminds of the days when I started to watch films. I have no idea how popular it was at the time and if I saw it before, but “Road House” makes an alright film if you feel like watching an easy watching classic.